We are fortunate to have fresh meals cooked on the premises each day provided by Herts Catering Ltd. There is a choice of two hot meals or a cold lunch along with a salad bar. School meals run on a 3 week menu cycle. The emphasis is on healthy eating. Our cook is able to cater for special dietary needs if she is advised in advance. Lunch times are well supervised by our MSA team. Children may bring a packed lunch from home. (Cans, glass bottles, fizzy drinks and sweets are not allowed) , please encourage your child to include healthy food in their lunch box. Galley Hill Primary School can only order meals when they have been paid for in advance. Dinner money should be paid on a Monday or the first day of a new term. The cost is £2.40 per day/£12.00 per week for Key Stage 2 (Year 3-6). All children in Reception and Years 1 & 2 are entitled to universal free school meals under current Government funding. Payments can be made online at https://login.schoolgateway.com/ . Please ensure cheques are made payable to Herts Catering Ltd. Any cash or cheques should be in a sealed envelope with your child’s name, class and the amount clearly labelled on it. This envelope can either be given to the class teacher, directly to the office or placed in the secure box at the side of the reception area. Please do not send in loose change with your child as this can become mislaid or lost. We cannot accept any responsibility if this results. If, due to benefits you receive, you maybe entitled to Free School Meals; please contact 0300 123 4048 to find out if you are eligible, registering also gives you access to other benefits. Herts Catering Ltd (HCL) is an independent Company, your payments for meals are passed by the School to HCL. At Galley Hill Primary School we feel that a system that works best is a ‘zero tolerance’ approach to dinner money debts. We understand that it may seem a very hard stance but please understand that small amounts can add up, therefore our policy is to ensure all debts are cleared. Daily reminders also help to prevent any discrepancies there may be with outstanding amounts. If debts are incurred, the school has to pay for the meals eaten. This means that money which should be spent on the children’s education has to be used for debts incurred by parents. The school is no longer able to carry any outstanding debts. 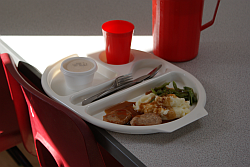 If your child is arriving late, but needs a school dinner, please call the school office to advise us before 9.30 a.m., this will enable us to order their meal. We will be unable to order a school dinner after 9.30 a.m. Please provide your child with a packed lunch if arriving before lunch time and no meal has been ordered. may bring in a piece of fruit to eat at morning break. their own water bottles to drink from during the day.